Here are some tips about ghost hunting and using equipment in Conover Square. It is a combination of general ghost hunting information as well as some specific to our location. -In some areas of the building, EMF detectors can be extremely unreliable. Throughout the 120+ year history of the building, many modifications & additions were made to the electrical system in the building. This results in a great deal of interference with our meters. Additionally, across the street from the southeast side of the building, there is an electrical power station. This generates a great deal of electromagnetic energy that drives our meters wild! While in affected areas, try to find a location and orientation where they are silent. Set it down and wait for activity. Watch for any kind of pattern that might indicate it is responding to your questions or requests. -When conducting an EVP session, try to be as quiet as possible. If you must talk, don’t whisper! Many EVP come across sounding like whispers, so this can be confusing when listening back later. If your stomach gurgles, a car drives by, or if you make or notice any noises, “tag” that sound. This is done by saying “A car drove by” or “I dropped my flashlight”. It may seem odd at the time, but if you are listening to the recording days or weeks later, that car you forgot to tag may now sound quite different! When asking questions, wait 10-15 seconds for an answer. Try to keep your questions simple; spirits may have trouble following complex questions. -ORBS! No, probably not. Most point-and-click digital and mobile phone cameras have the flash mounted near the lens. This orientation makes photos highly susceptible to flashes reflecting/illuminating dust particles in the air (although even SLR cameras are not immune). 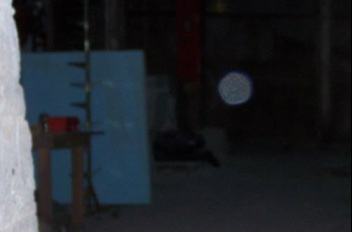 These show up as seemingly large glowing objects in photos. Generally, unless a ball of light is partially obscured behind an object or you witness the object with your own eyes before the photograph is taken, then you probably have a picture of dust. One only has to watch a minute of night vision video shot in the building to appreciate just how much dust is floating around here! At times, it appears as though we're recording a snow storm! Guests have captured some remarkable videos of light anomalies, as well as some photos that defy our level of explanation. These, however, are far less common than “dust orbs”. Take all the photos that you can; you never know what may show up!